Matches will be broadcast in English, Hindi, and other regional languages. 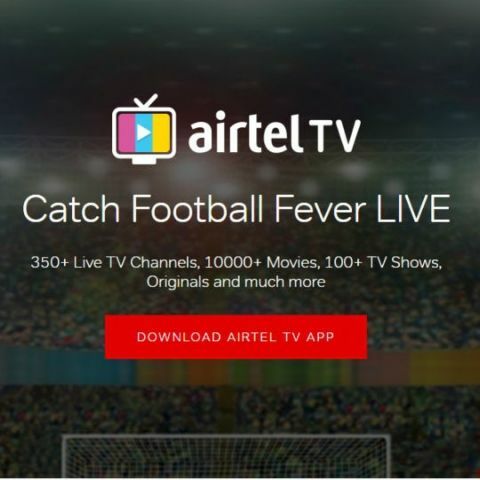 Telecom giant Airtel has updated its Airtel TV mobile app to enable its users to watch live broadcasts of the upcoming FIFA football tournament. In a recent press release, Airtel announced that the live broadcasts would be available for users to watch in various local languages, in addition to English and Hindi. Airtel also announced that the updated app will give its users access to match schedules and other updates related to the game. It will also let its users enjoy exclusive behind-the-scenes match snippets, along with reviews and previews of the match. “At Airtel TV, we are driven by the constant desire to offer the best content experience to our customers with high relevance value. While T20 cricket tournament received great feedback from our users, we are confident of recreating the same magic with the upcoming football extravaganza as well. We are delighted that the Airtel TV app is fast becoming the go to destination for sports lovers in India,” Sameer Batra, the CEO of Content and Apps at Bharti Airtel commented. To access the updated content on the Airtel TV mobile app, users need only upgrade to the latest version of the app on their Android or iOS devices. According to Airtel, all content on Airtel TV app is free for Airtel Postpaid and Prepaid customers until December 2018. Luckily, in this day and age, there’s more than one way to enjoy the football madness over the internet. Just yesterday, we listed the number of ways one can watch the FIFA World Cup tournaments without a television. The JioTV app from Jio will also broadcast the World Cup live. The premium content will be available to all Jio users for free. Sony Pictures Network India too announced that its digital platform, the SonyLIV app, will live-stream the matches during the 32-nation tournament.